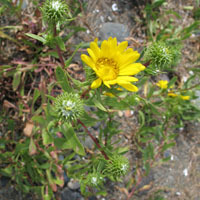 This fascinating perennial has thick fleshy leaves and cheery yellow flower that bloom throughout the summer into fall. Of particular interest are the large sticky buds that ooze a white goop. Fantastic for marine shorelines.